Mr. Gribble sat in his small front parlour in a state of angry amazement. It was half-past six and there was no Mrs. Gribble; worse still, there was no tea. It was a state of things that had only happened once before. That was three weeks after marriage, and on that occasion Mr. Gribble had put his foot down with a bang that had echoed down the corridors of thirty years. The fire in the little kitchen was out, and the untidy remains of Mrs. Gribble's midday meal still disgraced the table. More and more dazed, the indignant husband could only come to the conclusion that she had gone out and been run over. Other things might possibly account for her behaviour; that was the only one that would excuse it. His meditations were interrupted by the sound of a key in the front door, and a second later a small, anxious figure entered the room and, leaning against the table, strove to get its breath. The process was not helped by the alarming distension of Mr. Gribble's figure. "I--I got home--quick as I could--Henry," said Mrs. Gribble, panting. "Where is my tea?" demanded her husband. "What do you mean by it? The fire's out and the kitchen is just as you left it." "I--I've been to a lawyer's, Henry," said Mrs. Gribble, "and I had to wait." "I got a letter this afternoon telling me to call. Poor Uncle George, that went to America, is gone." "That is no excuse for neglecting me," said Mr. Gribble. "Of course people die when they are old. Is that the one that got on and made money?" His wife, apparently struggling to repress a little excitement, nodded. "He--he's left me two hundred pounds a year for life, Henry," she said, dabbing at her pale blue eyes with a handkerchief. "They're going to pay it monthly; sixteen pounds thirteen shillings and fourpence a month. That's how he left it." "Two hund--" began Mr. Gribble, forgetting himself. "Two hun----Go and get my tea! If you think you're going to give yourself airs because your uncle's left you money, you won't do it in my house." He took a chair by the window, and, while his wife busied herself in the kitchen, sat gazing in blank delight at the little street. Two hundred a year! 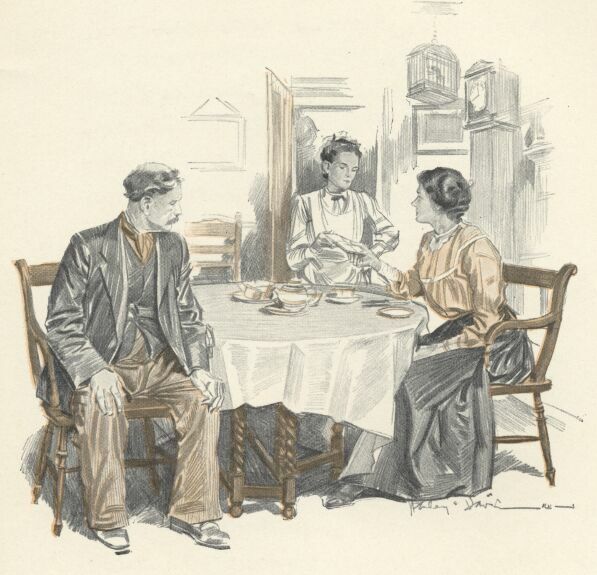 It was all he could do to resume his wonted expression as his wife re-entered the room and began to lay the table. His manner, however, when she let a cup and saucer slip from her trembling fingers to smash on the floor left nothing to be desired. "It's nice to have money come to us in our old age," said Mrs. Gribble, timidly, as they sat at tea. "It takes a load off my mind." "Old age!" said her husband, disagreeably. "What d'ye mean by old age? I'm fifty-two, and feel as young as ever I did." "You look as young as ever you did," said the docile Mrs. Gribble. "I can't see no change in you. At least, not to speak of." "Not so much talk," said her husband. "When I want your opinion of my looks I'll ask you for it. When do you start getting this money?" "Tuesday week; first of May," replied his wife. "The lawyers are going to send it by registered letter." "I shall be sorry to leave the house for some things," said his wife, looking round. "We've been here a good many years now, Henry." "Leave the house!" repeated Mr. Gribble, putting down his tea-cup and staring at her. "Leave the house! What are you talking about?" "But we can't stay here, Henry," faltered Mrs. Gribble. "Not with all that money. They are building some beautiful houses in Charlton Grove now--bathroom, tiled hearths, and beautiful stained glass in the front door; and all for twenty-eight pounds a year." "Wonderful!" said the other, with a mocking glint in his eye. "And iron palings to the front garden, painted chocolate-colour picked out with blue," continued his wife, eyeing him wistfully. Mr. Gribble struck the table a blow with his fist. "This house is good enough for me," he roared; "and what's good enough for me is good enough for you. You want to waste money on show; that's what you want. Stained glass and bow-windows! You want a bow-window to loll about in, do you? Shouldn't wonder if you don't want a servant-gal to do the work." "We're going to live as we've always lived," pursued Mr. Gribble. "Money ain't going to spoil me. I ain't going to put on no side just because I've come in for a little bit. If you had your way we should end up in the workhouse." He filled his pipe and smoked thoughtfully, while Mrs. Gribble cleared away the tea-things and washed up. Pictures, good to look upon, formed in the smoke-pictures of a hale, hearty man walking along the primrose path arm-in-arm with two hundred a year; of the mahogany and plush of the saloon bar at the Grafton Arms; of Sunday jaunts, and the Oval on summer afternoons. He ate his breakfast slowly on the first of the month, and, the meal finished, took a seat in the window with his pipe and waited for the postman. Mrs. Gribble's timid reminders concerning the flight of time and consequent fines for lateness at work fell on deaf ears. He jumped up suddenly and met the postman at the door. "Has it come?" inquired Mrs. Gribble, extending her hand. By way of reply her husband tore open the envelope and, handing her the covering letter, counted the notes and coin and placed them slowly in his pockets. Then, as Mrs. Gribble looked at him, he looked at the clock, and, snatching up his hat, set off down the road. He was late home that evening, and his manner forbade conversation. Mrs. Gribble, with the bereaved air of one who has sustained an irremediable loss, sighed fitfully, and once applied her handkerchief to her eyes. "That's no good," said her husband at last; "that won't bring him back." "Bring who back?" inquired Mrs. Gribble, in genuine surprise. "Why, your Uncle George," said Mr. Gribble. "That's what you're turning on the water-cart for, ain't it?" "I wasn't thinking of him," said Mrs. Gribble, trying to speak bravely. "I was thinking of----"
"Well, you ought to be," interrupted her husband. "He wasn't my uncle, poor chap, but I've been thinking of him, off and on, all day. That bloater-paste you are eating now came from his kindness. I brought it home as a treat." "I was thinking of my clothes," said Mrs. Gribble, clenching her hands together under the table. "When I found I had come in for that money, the first thing I thought was that I should be able to have a decent dress. My old ones are quite worn out, and as for my hat and jacket--"
"Go on," said her husband, fiercely. "Go on. That's just what I said: trust you with money, and we should be poorer than ever." "I'm ashamed to be seen out," said Mrs. Gribble. "A woman's place is the home," said Mr. Gribble; "and so long as I'm satisfied with your appearance nobody else matters. So long as I am pleased, that's everything. What do you want to go dressing yourself up for? Nothing looks worse than an over-dressed woman." "What are we going to do with all that money, then?" inquired Mrs. Gribble, in trembling tones. "That'll do," said Mr. Gribble, decidedly. "That'll do. One o' these days you'll go too far. You start throwing that money in my teeth and see what happens. I've done my best for you all these years, and there's no reason to suppose I sha'n't go on doing so. What did you say? What!" Mrs. Gribble turned to him a face rendered ghastly by terror. "I--I said--it was my money," she stammered. Mr. Gribble rose, and stood for a full minute regarding her. Then, kicking a chair out of his way, he took his hat from its peg in the passage and, with a bang of the street-door that sent a current of fresh, sweet air circulating through the house, strode off to the Grafton Arms. It was past eleven when he returned, but even the spectacle of his wife laboriously darning her old dress failed to reduce his good-humour in the slightest degree. In a frivolous mood he even took a feather from the dismembered hat on the table and stuck it in his hair. He took the stump of a strong cigar from his lips and, exhaling a final cloud of smoke, tossed it into the fireplace. "Uncle George dead," he said, at last, shaking his head. "Hadn't pleasure acquaintance, but good man. Good man." He shook his head again and gazed mistily at his wife. "He was a teetotaller," she remarked, casually. "He was tee-toiler," repeated Mr. Gribble, regarding her equably. "Good man. Uncle George dead-tee-toller." Mrs. Gribble gathered up her work and began to put it away. "Bed-time," said Mr. Gribble, and led the way upstairs, singing. His good-humour had evaporated by the morning, and, having made a light breakfast of five cups of tea, he went off, with lagging steps, to work. It was a beautiful spring morning, and the idea of a man with two hundred a year and a headache going off to a warehouse instead of a day's outing seemed to border upon the absurd. What use was money without freedom? His toil was sweetened that day by the knowledge that he could drop it any time he liked and walk out, a free man, into the sunlight. By the end of a week his mind was made up. Each day that passed made his hurried uprising and scrambled breakfast more and more irksome; and on Monday morning, with hands in trouser-pockets and legs stretched out, he leaned back in his chair and received his wife's alarming intimations as to the flight of time with a superior and sphinx-like smile. "It's too fine to go to work to-day," he said, lazily. "Come to that, any day is too fine to waste at work." Mrs. Gribble sat gasping at him. "So on Saturday I gave 'em a week's notice," continued her husband, "and after Potts and Co. had listened while I told 'em what I thought of 'em, they said they'd do without the week's notice." "You've never given up your job?" said Mrs. Gribble. "I spoke to old Potts as one gentleman of independent means to another," said Mr. Gribble, smiling. "Thirty-five bob a week after twenty years' service! And he had the cheek to tell me I wasn't worth that. When I told him what he was worth he talked about sending for the police. What are you looking like that for? I've worked hard for you for thirty years, and I've had enough of it. Now it's your turn." "You'd find it hard to get another place at your age," said his wife; "especially if they wouldn't give you a good character." "Place!" said the other, staring. "Place! I tell you I've done with work. For a man o' my means to go on working for thirty-five bob a week is ridiculous." "But suppose anything happened to me," said his wife, in a troubled voice. "That's not very likely," said Mr. Gribble. "You're tough enough. And if it did your money would come to me." Mrs. Gribble shook her head. "WHAT?" roared her husband, jumping up. "I've only got it for life, Henry, as I told you," said Mrs. Gribble, in alarm. "I thought you knew it would stop when I died." "And what's to become of me if anything happens to you, then?" demanded the dismayed Mr. Gribble. "What am I to do?" Mrs. Gribble put her handkerchief to her eyes. "And don't start weakening your constitution by crying," shouted the incensed husband. "I sa--sa--said, let's hope--you'll go first," sobbed his wife. "Then it will be all right." Mr. Gribble opened his mouth, and then, realizing the inadequacy of the English language for moments of stress, closed it again. He broke his silence at last in favour of Uncle George. "Mind you," he said, concluding a peroration which his wife listened to with her fingers in her ears--"mind you, I reckon I've been absolutely done by you and your precious Uncle George. I've given up a good situation, and now, any time you fancy to go off the hooks, I'm to be turned into the street." "I'll try and live, for your sake, Henry," said his wife. "Think of my worry every time you are ill," pursued the indignant Mr. Gribble. Mrs. Gribble sighed, and her husband, after a few further remarks concerning Uncle George, his past and his future, announced his intention of going to the lawyers and seeing whether anything could be done. He came back in a state of voiceless gloom, and spent the rest of a beautiful day indoors, smoking a pipe which had lost much of its flavour, and regarding with a critical and anxious eye the small, weedy figure of his wife as she went about her work. The second month's payment went into his pocket as a matter of course, but on this occasion Mrs. Gribble made no requests for new clothes or change of residence. A little nervous cough was her sole comment. "Got a cold?" inquired her husband, starting. "I don't think so," replied his wife, and, surprised and touched at this unusual display of interest, coughed again. "Is it your throat or your chest?" he inquired, gruffly. Mrs. Gribble coughed again to see. After five coughs she said she thought it was her chest. "You'd better not go out o' doors to-day, then," said Mr. Gribble. "Don't stand about in draughts; and I'll fetch you in a bottle of cough mixture when I go out. What about a lay-down on the sofa?" His wife thanked him, and, reaching the sofa, watched with half-closed eyes as he cleared the breakfast-table. It was the first time he had done such a thing in his life, and a little honest pride in the possession of such a cough would not be denied. Dim possibilities of its vast usefulness suddenly occurred to her. She took the cough mixture for a week, by which time other symptoms, extremely disquieting to an ease-loving man, had manifested themselves. Going upstairs deprived her of breath; carrying a loaded tea-tray produced a long and alarming stitch in the side. The last time she ever filled the coal-scuttle she was discovered sitting beside it on the floor in a state of collapse. "You'd better go and see the doctor," said Mr. Gribble. Mrs. Gribble went. Years before the doctor had told her that she ought to take life easier, and she was now able to tell him she was prepared to take his advice. "And, you see, I must take care of myself now for the sake of my husband," she said, after she had explained matters. "I understand," said the doctor. "If anything happened to me--" began the patient. "Nothing shall happen," said the other. "Stay in bed to-morrow morning, and I'll come round and overhaul you." Mrs. Gribble hesitated. "You might examine me and think I was all right," she objected; "and at the same time you wouldn't know how I feel." "I know just how you feel," was the reply. "Good-bye." He came round the following morning and, following the dejected Mr. Gribble upstairs, made a long and thorough investigation of his patient. "Say 'ninety-nine,'" he said, adjusting his stethoscope. Mrs. Gribble ticked off "ninety-nines" until her husband's ears ached with them. The doctor finished at last, and, fastening his bag, stood with his beard in his hand, pondering. He looked from the little, whitefaced woman on the bed to the bulky figure of Mr. Gribble. "You had better lie up for a week," he said, decidedly. "The rest will do you good." "Nothing serious, I s'pose?" said Mr. Gribble, as he led the way downstairs to the small parlour. "She ought to be all right with care," was the reply. "Care?" repeated the other, distastefully. "What's the matter with her?" "She's not very strong," said the doctor; "and hearts don't improve with age, you know. Under favourable conditions she's good for some years yet. The great thing is never to thwart her. Let her have her own way in everything." "Own way in everything?" repeated the dumbfounded Mr. Gribble. The doctor nodded. "Never let her worry about anything," he continued; "and, above all, never find fault with her." "Not," said Mr. Gribble, thickly--"not even for her own good?" "Unless you want to run the risk of losing her." "Let her have an easy time," said the doctor, taking up his hat. "Pamper her a bit if you like; it won't hurt her. Above all, don't let that heart of hers get excited." He shook hands with the petrified Mr. Gribble and went off, grinning wickedly. He had few favourites, and Mr. Gribble was not one of them. For two days the devoted husband did the housework and waited on the invalid. Then he wearied, and, at his wife's suggestion, a small girl was engaged as servant. She did most of the nursing as well, and, having a great love for the sensational, took a grave view of her mistress's condition. It was a relief to Mr. Gribble when his wife came downstairs again, and he was cheered to see that she looked much better. His satisfaction was so marked that it brought on her cough again. "It's this house, I think," she said, with a resigned smile. "It never did agree with me. "Well, you've lived in it a good many years," said her husband, controlling himself with difficulty. "It's rather dark and small," said Mrs. Gribble. "Not but what it is good enough for me. And I dare say it will last my time." "Nonsense!" said her husband, gruffly. "You want to get out a bit more. You've got nothing to do now we are wasting all this money on a servant. Why don't you go out for little walks?" Mrs. Gribble went, after several promptings, and the fruit of one of them was handed by the postman to Mr. Gribble a few days afterwards. Half-choking with wrath and astonishment, he stood over his trembling wife with the first draper's bill he had ever received. "One pound two shillings and threepence three-farthings!" he recited. "It must be a mistake. It must be for somebody else." Mrs. Gribble, with her hand to her heart, tottered to the sofa and lay there with her eyes closed. "I had to get some dress material," she said, in a quavering voice. "You want me to go out, and I'm so shabby I'm ashamed to be seen." Mr. Gribble made muffled noises in his throat; then, afraid to trust himself, he went into the back-yard and, taking a seat on an upturned bucket, sat with his head in his hands peering into the future. The dressmaker's bill and a bill for a new hat came after the next monthly payment; and a bill for shoes came a week later. Hoping much from the well-known curative effects of fine feathers, he managed to treat the affair with dignified silence. The only time he allowed full play to his feelings Mrs. Gribble took to her bed for two days, and the doctor had a heart-to-heart talk with him on the doorstep. It was a matter of great annoyance to him that his wife still continued to attribute her ill-health to the smallness and darkness of the house; and the fact that there were only two of the houses in Charlton Grove left caused a marked depression of spirits. It was clear that she was fretting. The small servant went further, and said that she was fading away. They moved at the September quarter, and a slight, but temporary, improvement in Mrs. Gribble's health took place. Her cheeks flushed and her eyes sparkled over new curtains and new linoleum. The tiled hearths, and stained glass in the front door filled her with a deep and solemn thankfulness. The only thing that disturbed her was the fact that Mr. Gribble, to avoid wasting money over necessaries, contrived to spend an unduly large portion on personal luxuries. "We ought to have some new things for the kitchen," she said one day. "No money," said Mr. Gribble, laconically. "And a mat for the bathroom." Mr. Gribble got up and went out. She had to go to him for everything. Two hundred a year and not a penny she could call her own! She consulted her heart, and that faithful organ responded with a bound that set her nerves quivering. If she could only screw her courage to the sticking-point the question would be settled for once and all. White and trembling she sat at breakfast on the first of November, waiting for the postman, while the unconscious Mr. Gribble went on with his meal. The double-knocks down the road came nearer and nearer, and Mr. Gribble, wiping his mouth, sat upright with an air of alert and pleased interest. Rapid steps came to the front door, and a double bang followed. "Always punctual," said Mr. Gribble, good-humouredly. His wife made no reply, but, taking a blue-crossed envelope from the maid in her shaking fingers, looked round for a knife. Her gaze encountered Mr. Gribble's outstretched hand. "After you," he said sharply. Mrs. Gribble found the knife, and, hacking tremulously at the envelope, peeped inside it and, with her gaze fastened on the window, fumbled for her pocket. She was so pale and shook so much that the words died away on her husband's lips. "You--you had better let me take care of that," he said, at last. "It is--all right," gasped his wife. She put her hand to her throat and, hardly able to believe in her victory, sat struggling for breath. Before her, grim and upright, her husband sat, a figure of helpless smouldering wrath. "You might lose it," he said, at last. "I sha'n't lose it," said his wife. To avoid further argument, she arose and went slowly upstairs. Through the doorway Mr. Gribble saw her helping herself up by the banisters, her left hand still at her throat. Then he heard her moving slowly about in the bedroom overhead. He took out his pipe and filled it mechanically, and was just holding a match to the tobacco when he paused and gazed with a puzzled air at the ceiling. "Blamed if it don't sound like somebody dancing!" he growled. Add The Weaker Vessel to your own personal library.